It is said that “The smallest mind have the greatest imagination.” Indeed we found this to be true when we had the honour to conduct a drawing competition at Kendriya Vidyalaya, Roorkee. The ending of 2017 was special for us when we met some artistic small minds, who had their hopes so high and values so down to earth. The children were just so excited to draw their imagination on a piece of paper and with a heartfelt enthusiasm. 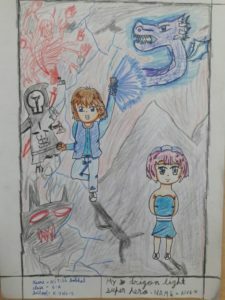 Every child tried to portray a different story and a different character through pencil and colours. They wanted their superheroes to solve the problems they face in this huge world. Though every sketch they made was mesmerising, still we managed to pick out some of the best sketches from the competition for all of our viewers around the corner. 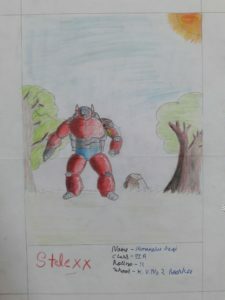 The above sketch was by a 6th standard student Nitish. This small sketch depicted a story and a superhero. Nitish called this superhero by his Dragon light superhero and named it ‘Aiven’. This cute sketch was by Ilma hussain a sixth standard student. Instead of a superhero, she created a Supergirl. This world is ruled by girls, You know right? So who needs a superhero when Supergirl can protect you!! 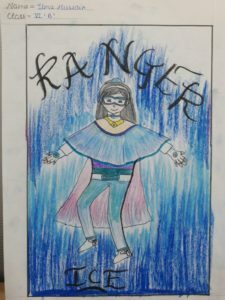 Ilma named this Supergirl ‘Ranger Ice’. Another masterpiece from those small kids was this sketch. A superhero named Stelexx. I wonder how they bring so much creativity not only in the sketch but also in names. Well, this sketch was made by Himanshu Negi another sixth standard student whose mind is filled with creativity and love for art.